The next day was our last day in Istanbul. We were due to leave after midnight so we pretty much had the whole day to spend. It was a bit tricky because we were to check out before noon. I have to say the timing of the flight was rather inconvenient but that was the way it went. I guess you can always pay for another night if you want to enjoy the rest of the day relaxing or napping in your hotel room but that's not what we did. 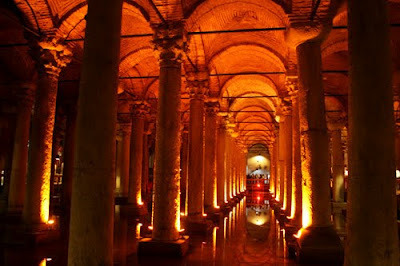 The plan for the day was to go to Basilica Cistern and take a Bosphorus tour. 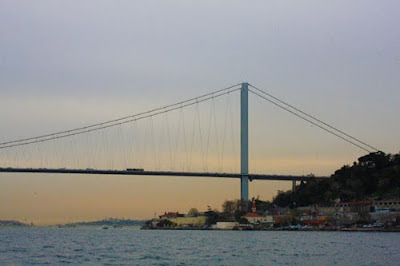 Since we had so much time to kill, I thought we should take the full bosphorus tour which departs at 13:35 and be back at 18:35. Since my source was googling, I wasn't actually sure if the information I got was correct but still I thought we could just start the day late. Maybe it was our body clock but we didn't start the day late. I think we finished our check out even before 10. The hotel was nice, they gave us 2 packs of coffee as presents :) We left our luggages with them and they told us that our pick up time for the airport was 09:30 pm. So much time to kill. So first, it's a walk to the pier. We could actually walk there. It was a nice sunshiny day, very cooling, a really great day to be spent outside. Found the Bosphorus Pier and saw the schedule and my googling was right, so we got our tickets at 25 TL each. 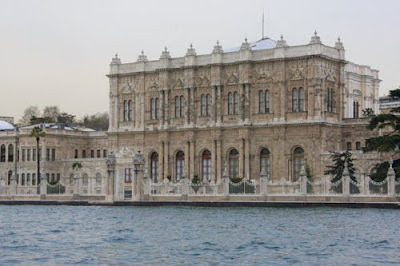 Oh I have to say that there are private tours which arrange for a tour of the bosphorus but I wasn't really sure what they offer exactly and they always come at a higher price, so I thought this one was not bad. Since that was like only 10 am something, we had so much time to kill. We crossed the street and visited 2 mosques and the spice bazaar. The hotel lady who talked to us the day before told us to see these 2 mosques which she found to be more beautiful than the blue mosque :P Well it was really less touristy and it made me rather nervous about going in. However just like the blue mosque, it's also open for tourists. We followed a small group going in. Since there weren't many tourists, they don't provide plastic bag, you just put your shoes on the racks, which is fine. The first one we went to was Yeni Camii or the New Mosque. Again it's pretty. The dome had this nice design with a color palette like one you can find in a baby's room. 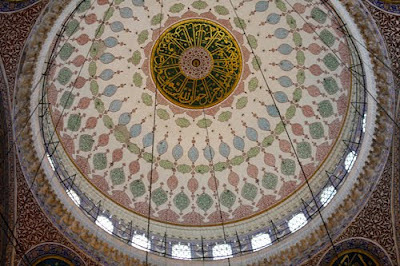 Maybe because it's something really new for me, but I really enjoyed and was in awe seeing how pretty the mosques were. Next it was to the spice bazaar which was right next to it. Obviously as indicated by its name, most of the sellers here sell spices and also turkish delights. It was smaller than the Grand Bazaar which is great and just like the Grand Bazaar, it was also photogenic. It was very interesting to see mounds of spices for everything that you didn't even know exists. Also there were many types of tea. 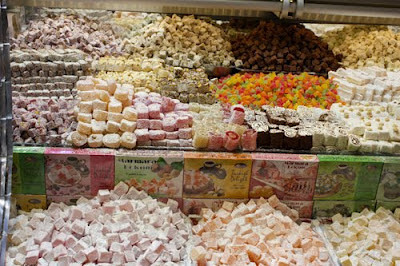 Then there were many types of turkish delight and dried fruits. Since we already bought our things and it would be too impratical to be carrying many things as we spent our day, we didn't buy anything here. To see pictures of the Spice Bazaar and the Grand Bazaar (I combined the pictures from these 2 places in 1 set), you can go here. 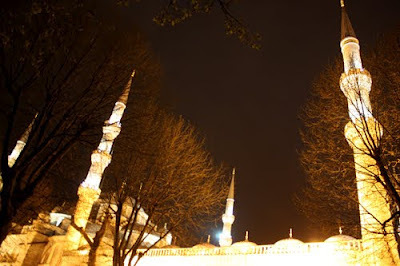 Then it was a short walk to another mosque nearby, Rüstem Pasha Mosque. I like this mosque perhaps because it was brighter inside and the more minimalistic approach in the design. Perhaps because of its brightness and the maroon / brown and white color blocks, it reminded me a lot of Basilique De La Garde in Marseille which I was very lucky to visit last year. 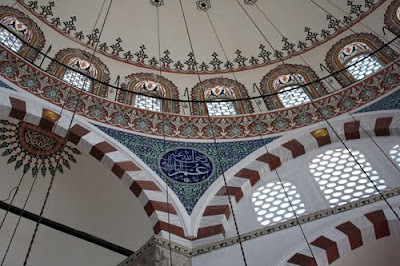 To see pictures from Yeni Camii and Rüstem Pasha Mosque, you can go here. Overall, I'm glad that we got to see these 2 mosques which weren't in the initial plan. It was also nice that there weren't many tourists there. I am thankful that there were some because as I said, I still got nervous about entering a mosque because I was just not sure if I was allowed to. So seeing other tourists was nice. I guess with mosques, it's a different kind of feeling. Not like if I'm in Italy, in which I wouldn't hesitate entering any church I encounter. Anyways, we still had time, so we decided to walk to Basilica Cistern. It was perhaps not a very good decision because obviously we got confused and the hilly area didn't make it a comfortable walk but we made it *yay* Basilica Cistern was something really magnificent. There were many tall columns underground with a pool of water. It was very cool inside it which was nice and to think about the construction of it, it was really fascinating. I'm not sure how it worked as a cistern though. In general, I just don't know how cistern works :( Anyways, found the wishing column like the one in Hagia Sophia and made my wish there by putting my thumb into the hole and trying to make a full circle twisting my hand. I guess not many people know about it and like many of these things, their ability to grant wishes are questionable. I guess this one wasn't as famous like the one in Hagia Sophia. I think many people think the wishing column means that you have to throw coins into the area around it which did have many coins. Then of course there were the 2 famous medusa heads which were filled with tourists trying to take pictures. Me too. Unfortunately pictures from this place didn't turn out so well because it didn't have much light in it. I like the cistern a lot even though it pretty much didn't have anything much inside it but columns, but I still think it's cool and it's always nice to be in a place which is literally cool :P To see more pictures from Basilica Cistern, you can go to this set. After which, YeeMaggio had lunch and then we went back to the pier for our boat trip. We decided to take the tram this time and stopped in Eminonu. For precaution, I took a motion sickness pill though I think it wasn't necessary. It was quite a long trip. I spent most of it standing up taking pictures. It was windy on the boat so it was rather cold. It was interesting to see the buildings around the Bosphorus strait. Took this picture of Dolmabahçe Palace. At some point, I just stopped taking pictures and just saw the view. I remembered standing next to this older guy who was snapping pictures. We didn't talk but it was pretty peaceful to be standing next to him and hearing his camera clicks. You can actually get off in any of the stop and then get on again when the boat is making the route back but like many others, we decided to stop at the last stop in Anadolu Kavağı. I vaguely remembered reading that you could go up hill to see something. When we arrived we just saw many seafood restaurants and some shops and we weren't sure what to do with the around 2-hour break. We walked around a bit and saw some tourists following a street up the hill and we did the same. Man! It was tough. It was physically tough that I seriously wondered if the view would be worth it. I just comforted myself that it would be so nice walking this road on the way down. I couldn't make this hike without stopping though, especially because some of the last parts involved climbing stairs. I had to stop and take a breather. 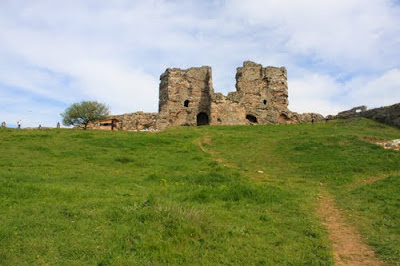 My breath was short and I was panting but I made it up to what I now found out (I just googled it) to be Yoros Castle. I remembered there was this gate to enter it and it was weird, there was a man guarding it and he would open the gate and then lock it. When he saw several people wanting to go in or go out, he would open the gate but he would lock it again. I'm not sure why he did that. Anyway, when I got in, the man locked the gate behind me and YeeMaggio was left behind but she eventually got in. I remember that I just straight away sat down and then there's this tree in front of me. Not the most beautiful tree I've seen but it felt comforting and I remembered thinking something like, hello tree, I climbed all the way up here just to see you :P There was nothing much there really. We were in this walled area. We could see the sea below and it was actually the black sea down there but of course as you know it's not black. I just thought the view was ordinary and after the long and demanding hike, it wasn't really rewarding. I guess the reward came in the form that you made it there. I, who's so not healthy or fit, made the long hike up and I didn't know that I could do that. That's the tree I was talking about, the only tree there. After some time there, it was time to go down. On the way down I saw this group of Italians who were like they're gonna faint. It was really seriously hard. If you want to do it, do it just as you get off the boat because you must factor in the time taken to go up, see the view, and go back. It was seriously a nicer walk down. I'm pretty sure we took less time going down than up. I had a fish meal there while waiting for the boat. Then it was the boat ride back. Again, I spent most of the time standing. This time in the lower deck which was more windy. It got pretty sentimental at that time, being alone, cold, and reflecting on life and the journey which was ending, and just emptying the brain and seeing the view. I think I really needed that solitary quiet moment. I always need my time alone. The sun was setting and truly it just got very sentimental for me. So after that, at around 9 pm, we decided to go back to our hotel. This time we decided to take the tram and it took us less than 15 minutes to reach the hotel. The hotel staff decided to call our car early and we left before 09:30 pm. The staff were really nice, they said goodbye with a smile and a thank you and I totally would love to stay in their hotel again. Our driver was also nice. He was chirpy. Because of our rather late timing, it was a breeze to get out of the maze, but our driver was still driving really really fast that I was a bit worried. I wondered if I should tell him that we were not in a hurry because I wondered if that's the reason he drove so fast. However I knew he didn't speak english well, so I didn't say anything. He did put on the radio loudly which was saying the prayer which I believed was the prayer after maghrib and that kinda made me feel at ease a bit. I thought at least we had some prayers going on. I think it took us less than 30 minutes to reach the airport, a total opposite than when we arrived.